• Josh Ricci vs. Brandon Warne: Josh Ricci def. Brandon Warne via unanimous decision (29-27, 29-28, 29-28). • Alex Potts vs. Brandon Polcare: Alex Potts def. Brandon Polcare via submission (kimura) at 3:10 of Round 1. • Matt Secor vs. T.J. Summer: Matt Secor def. T.J. Summer via submission (Americana) at 4:00 of Round 1. • Fernando Gonzalez vs. Brennan Ward: Fernando Gonzalez def. 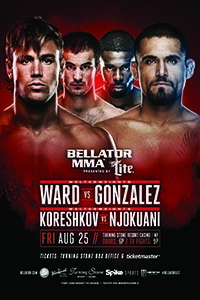 Brennan Ward via submission (guillotine choke) at 1:02 of- Round 3. • AJ McKee vs. Blair Tugman: A.J. McKee def. Blair Tugman via unanimous decision (30-27, 30-26, 30-26). • Ricky Rainey vs. Marc Stevens: Ricky Rainey def. Marc Stevens via unanimous decision (29-27, 29-27, 29-27). • Talita Nogueira vs. Amanda Bell: Talita Nogueira def. Amanda Bell via submission (rear-naked choke) at 3:44 of Round 1. • Vadim Nemkov vs. Philipe Lins: Vadim Nemkov def. Philipe Lins via knockout (punches) at 3:03 of Round 1. • Henry Corrales vs. Noad Lahat: Henry Corrales def. Noad Lahat via unanimous decision (30-27, 29-28, 29-28). • Kate Jackson vs. Colleen Schneider: Kate Jackson def. Colleen Schneider via TKO (injury) at 5:00 of Round 1. • Arlene Blencowe vs. Sinead Kavanagh: Arlene Blencowe def. Sinead Kavanagh via split decision (28-29, 30-27, 29-28).